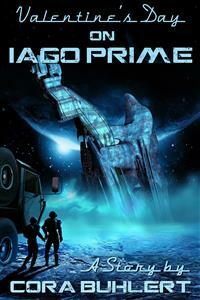 Kai and Maisie are about the celebrate their first Valentine's Day on the planet Iago Prime. However, the holiday traditions they established back on Earth such as celebrating Valentine's Day with a picnic on the beach are impossible to maintain in the hostile environment of their new home. But in spite of the many limitations imposed by living on Iago Prime, Kai pulls out all the stops to give Maisie an unforgettable Valentine's Day.This is a science fictional Valentine's Day story of 2200 words or approx. 10 print pages. It would be Maisie and Kai’s first Valentine’s Day on the newly settled Earth colony of Iago Prime. Of course, on Iago Prime a year was only two hundred and sixty two days long. But for religious and traditional holidays, the colonists still adhered to the old Earth calendar, even if it meant that Valentine’s Day fell into the middle of summer — or at least what passed for summer here on Iago Prime. Back on Earth, Maisie and Kai Jones — together for more than six years now and married for one and a half, mostly to fulfill the outdated requirements of the colony settlement board — had always celebrated Valentine’s Day by having a picnic on the beach. Of course, February wasn’t the ideal time for a romantic picnic on the beach at all, not when the beach was in Wales rather than California. But it was the tradition that Maisie and Kai had established for themselves and they were determined to stick to it, even if it meant shivering together on a blanket in Aberystwyth, eating sandwiches and drinking champagne from plastic cups and hot tea from a thermos. Kai and Maisie had met, when they were both students at the University of Cardiff, she of communication science and he in the engineering department. They shared a beer at the student union and bonded over their shared dream to go out into space one day, to become pioneers, the first humans to set foot onto a brand new world.